6 April 2015, ~ Horsereporter recently caught up with Tersk Stud Director Sergey Ivanov in Qatar. He was happy to tell us of some of the exciting advances of breeding at Tersk and that the Stud is looking forward to the spring and summer Shows and Open House where these special horses are presented to the world. There are 86 babies expected from 90 broodmares for the 2015 Tersk foal crop. As of February there were 46 babies already on the ground. 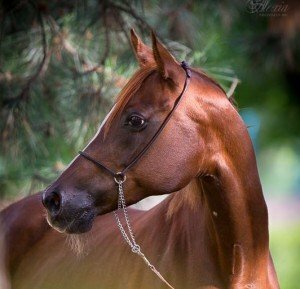 Tersk Stud is located in the Caucasus Mountains in southern European Russia. Babies come early in Russia and are generally born from 1 January to 1 April. As Russian winters can be quite cold, the mares all have stalls but are turned out each day to roam the steppes. In good weather from May until October the horses enjoy the tall grasses and wander naturally to drink the clear waters. Tersk Stud is now standing 16 stallions, and horses are both live-bred and inseminated, depending on the need and stallion chosen.